Kotobukiya expands beyond their DC Comics comic book and movie inspired ARTFX+ statues to include representations of the characters based on their TV appearances! Next up is Reverse Flash, the mysterious speedster in a yellow suit who killed Barry's mother in the year 2000. 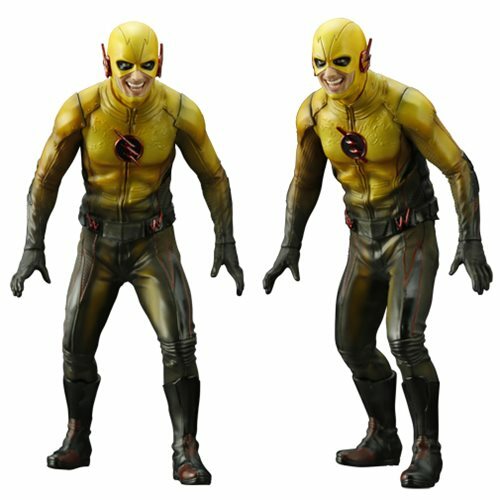 Based on The Flash TV show, Reverse-Flash is sculpted in detail so realistic, he looks like he walked straight from the TV screen! The Reverse Flash ArtFX+ PVC Statue stands about 6 1/2-inches tall in 1:10 scale and comes packaged in a window box. Requires 3x "LR41" batteries, included. Ages 15 and up.